Bucksnort Lodge offers an excellent price to value. This cabin is bordered by the United States National Forest, providing a close up encounter with nature and the privacy is second to none. Bucksnort Lodge decor is unique and comes from many generations of native heritage in the North Georgia Mountains, along with a tribute to many North American wildlife species, from Speckled Trout, Deer and Elk. Bucksnort Lodge is cozy and is in a great location off Aska Road and is only 8 minutes from the town of Blue Ridge, where you can find antique shopping, great eateries, sight seeing, a scenic railway and some good old fashioned friendly folks. Bucksnort is also located within walking distance to lake Blue Ridge, as well as the Toccoa River. A short drive from Bucksnort will put you at a riverside restaurant, tubing and many other outdoor activities. This is a great place to come and relax, get away from it all, and take in all the beautiful scenery and nature that Blue Ridge has to offer. Bucksnort Lodge is a 3 minute walk to Squat and Gobble, providing two cabins very close together, if you need that convenience. We are sorry but this cabin is not pet-friendly. 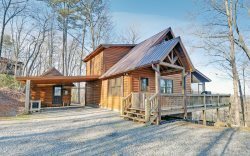 This Blue Ridge, GA Cabin Rental is located approximately 10 minutes from Downtown Blue Ridge, GA. The cabin is on up on a beautiful mountain in the Aska Adventure Area of Blue Ridge. This cabin has very easy access for any type of vehicle, is convenient to Downtown Blue Ridge, GA, Lake Blue Ridge, the Benton McKay Trail, the Toccoa River for tubing, and the Ocoee River for Whitewater Rafting. Also, horseback riding and zip lining are other close by activities. Bucksnort Lodge is very private and is considered a secluded Blue Ridge Cabin Rental. Bucksnort has end of the road privacy and adjoines the United States Forest Service for ultimate privacy. The booking was excellent by giving clear pricing on the cabin rental and provided clear information about additional fees for early check in and out. They were always ready to answer questions. They sent emails with nearby shops, restaurants and things to do in the area. They sent email reminders of the stay and I loved that I was able to esign the contract. Everything from the booking to the easy checkout was great. Clean cabin, easy access to cabin with keypad, availability of people to answer questions and take care of my concerns, and ease of use of gas fireplace and amenities. Clean cabin, enough room for my entire family, fully stocked kitchen. We found the team to be very friendly and accommodating. We felt they were very interested in our comfort and especially correcting anything that needed attention. It was a pleasure working with them. We really enjoyed our stay and was pleased overall with the cabin and amenities. Working with Georgia Mountain Cabins made the experience worthwhile. Staff was friendly and communicative by sending both email and alsocalling and leaving a message to see if everything was going well. Clean property and everything was professional. We had a great family experience! Not only was it great for my wife and I to get away, the kids also had an absolute blast! I would highly recommend this area and property! The staff was friendly and professional. It's obvious that they do their best to ensure that you are taken care of in every way. I'm hoping i get a chance to do business with them again in the near future. It was a beautiful canon in a beautiful location. I would definitely recommend this location for anyone looking for a weekend getaway. Very professional and courteous. Paul, Lindsey and Daphne are awesome! The team was very pleasant to work with. Communication was on target the entire time. We stayed during hurricane Irma to escape the storm in South Florida. It was a wonderful get away from the eye of the storm. It was so relaxing in a time of such stress. It was a beautiful rental property. I enjoyed my stay immensely. I would recommend it to any traveler . All of the features of the home are nice! Many bathrooms. The living room is enormous and the television is big. The couch is really nice. All of the furnishings are very nice. I also like the pool table downstairs. We were there during a hurricane so we got to be a lot of use out of the pool table. Most of my rental experience was done online but I did call the office about arriving after hours and was given very friendly accurate information. Also the information packet was very helpful and complete. Thanks for a great experience! We will be back! It was very clean. Great location. Nice beds and we had a great time with the pool table! The team was great to work with. Friendly and easy checkin. Great directions were given and easy to find property. Property was in great shape and super clean. Loved working with this company. They really go the extra mile. We were very pleased with the staff, accommodation and scenery. We had all we needed and everything was in great condition. Same reasons as above. Plus we were surprised at the town. The restaurants, shops and local talent was top of the line. We needed to change our original date & had no problem doing so. Emalene was great help & easy to work with!! We loved the cabin! It was exactly what we were looking for. Will definitely come back & recommend to others. We have rented with GA Mountain Cabins several times and have always had a great experience. We have been wanting to visit this area for a long time. We are so glad we did. Bucksnort was perfect! We would definitely stay there again. We have already recommended it to a friend. Thank you for an enjoyable experience. We had a great time and enjoyed the cabin and the area. Hope to be back next year. For the last 5 years I have stayed at a local hotel, your folks and property are far above and beyond. I will be a customer and advocate of yours from now on. My friends and I were very pleased with our stay, wish we could have stayed longer .Everyone in the office was friendly, courteous, knowledgeable and helpful. Thank you for everything. Everyone's friendly, knowledgeable and makes you feel comfortable.This was our first time getting a cabin.It won't be our last! Thanks!! Very enjoyable long weekend getaway! Arrived at the cabin, had a minor issue. Called and within an hour the guest services team arrived and took care of our issue. OUTSTANDING AND FRIENDLY!!! The Bucksport Lodge provided a serene living environment with family entertainment indoor and out. If we need or want to stay in Blue Ridge again, we will hope that it is available again. Everyone at the office was very friendly and helpful. No question left unanswered. I needed to see if we could stay an extra night on a Sunday and was responded to within minutes, which was a nice surprise.